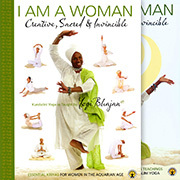 The Mantras of Kundalini Yoga by Maya Fiennes is the complete 7 DVD set, comprising 3 individual box sets. Be Happy, Achieve Wealth and Heal Yourself contains mantras which will give you the opportunity to grow mentally, physically and spiritually. They will help you to achieve your highest potential and to become the person whom you really are. Balance Your Hormones Accept Love focuses on balancing your whole body so that you are open to receive the integration of body, mind and spirit. This selection of mantras will help you to be more open to receive the greatness of life. Mantras are the yoga of the mind. A mantra is a syllable, word or phrase which can elevate or modify consciousness through its meaning, its sound, rhythm, tone or even the reflexology of the tongue on the palate. Repetition of a mantra can help bring your entire body to a higher frequency which resonates with the frequency of the Universe. It can clear your mind from negative thoughts and promote the natural healing properties of the body. Each mantra creates its own rhythm of breathing, which in turn expresses certain moods and emotions which will improve your mental state. Mantras can enable you to hear and see things beyond the physical world, remember dreams and silence the mind. Their power can also be enhanced by firstly seeing the mantra as you say it, and secondly by actively listening to it as you say it. The practice of mantras can change your experience of life, filling each day with enthusiasm and creative energy. A mantra can make the impossible possible.